Scale: 1/96? 7½"/ 191mm long. Overall Rating: 8 - would be 9 but for canopy! This is the Aoshima (ex Imai) Angel Interceptor that comes in a box containing: two complete kits, one stand (from the old Imai TB5 kit and even includes a sprue with some bits of the TB5 kit) and a cardboard section of Cloudbase deck. You can build one Angel "in flight" and one on the runway set to go. I elected to build the "in flight" one first. The kits are identical and it's up to you to remember to remove the nose gear if you want to for your in flight version. This is actually not a bad kit. It scales out at about 1/96 if you accept 60 feet as the length of a 'real' Angel interceptor. 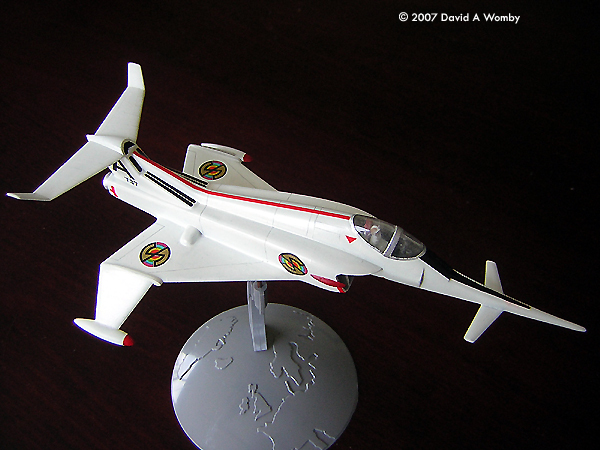 (FYI - the Airfix one scales at about 1/100 and the small Imai one at 1/128). The kit has a couple of inaccuracies. The most glaring one is the cockpit and its canopy which is not bad in side view but way too wide in plan view. It should taper from rear to front as you can see here. Less obvious is that the slope of the nose ahead of the canopy (the section from the front of the canopy to the nose cannon trough) is too steep. Other problems are the over thick wing which you just have to live with and the lack of moulded ailerons (I pencilled them on along with a few panel lines to replace the raised ones that I sanded off during construction). The cockpit is completely empty and you need to raise the seat considerably to position the pilot at the right height. If you don't, you will barely see the top of their head when finished. I added a headrest to the seat using scrap and a heads up display to the front of the cockpit. I also carved the pilot to make it a bit more feminine. 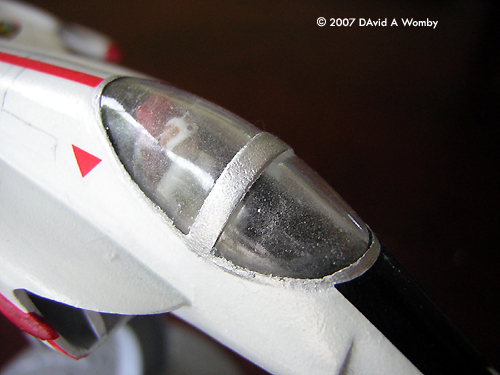 Unfortunately, although I did blank off the cockpit interior I didn't do it completely and when I spray painted the overall white, the spray got through the open intakes and clouded the inside of the canopy a little. You can still see the figure but not my finer details. Beware of that - the intakes are completely open. You may want to add a blanking plate or two in there. The nose probe needed sanding down to taper elegantly. The bottoms of the wingtip skids are hollow and need filling. Assembly was pretty straightforward but do some test fittings as you go. Making small adjustments before gluing was key to getting a good flush fit for the tailplanes and the overwing bulges that meet the fuselage. The canopy also benefits from a few test fittings and some reshaping of the lower edge. 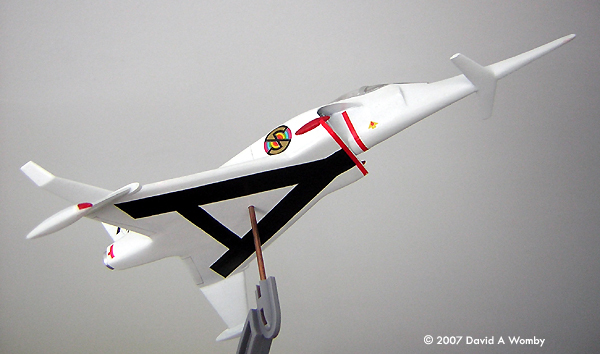 In the end, I needed to fill small gaps between the canopy and the fuselage with filler. Painting - well a coat of grey car primer showed up some poor seams which I fixed. Then it was pure white from a car spray can. As I mentioned earlier some of the mist got into the canopy underside. Then a few details with a brush - exhaust and canopy frame painted silver, skid tips and the bullet fairings on the intakes in red. Note - the skid tips undersides are white. Painting the bullets by hand was a bit stressful. My hand / eye coordination is at its limit on this kind of work! Then I did a few panel lines in pencil just to give its some character. Also stressful, so I didn't do very many. I did make a couple of mistakes and touched the paint up with a brush of flat white here and there to cover the pencil smudges. I also added 3 pencil dots to represent the tips of the missiles carried in the fairings on either side of the nose. It should be 5 per side but, again, my hand wasn't up to the job of fitting five dots onto that small space. 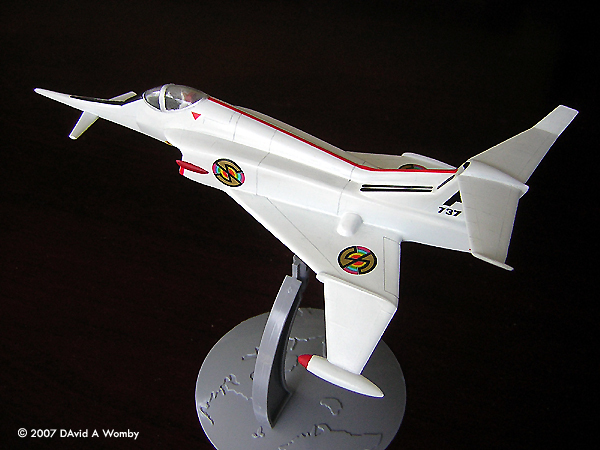 I then hand brushed coat of Future over the model and it was ready for decals. The decals in this kit are lovely. Nice detail, adhere well and saves you some painting as they include the two sections of black anti-dazzle panels and the large 'A' for the undersides. The long thin section of anti-dazzle panel that goes into the cannon trough along the top of the nose was very difficult to get into the recess and lay straight. I finally got it bedded into some Future and then touched up one edge with paint to fill the trough fully with black. Next time, I think I will just paint that one on and not bother with the decal. The 'A' on the underside is provided in pale blue and doesn't extend to meet the red at the lower intake lip as it should. So I cut it from the sheet and hand painted it black. Then once it had been applied and dried, I hand painted the extension from the top of the 'A' to the bottom of the intake lip before later applying the red intake lip decal over it. I don't get to spend much time modelling but I guess if I added all the time up that I spent on it, this would equate to about a week's worth of evenings. On the whole, I am pleased with the overall result and am already planning the build of the next one. I am also looking at ways to convert this kit to a MIG-242 from the opening episode of Joe90 and a World Air Force Viper (the plane the Angel Interceptor was supposedly developed from). I would prefer to make these conversions from this kit rather than carving up a more accurate but more precious Airfix Angel Interceptor. This page copyright © 2007 Starship Modeler. First posted on 21 March 2007.